I would love to win this cookbook! One of my family's favorite dishes is baked ziti. I use Trader Joe's gf pasta, my own "gravy", Italian turkey sausage, ricotta and mozzerella cheese. My family loves it. I love James Beard - his writing about food shows what a respect and admiration he had for the way the ingreditents can come together and create a delicious dish. I would love to see what Ms. Mallacora has been able to do after working with him. Thanks for sharing this here. What is not to love about Italian foods. From the antipasto, to the Minestrone, on with a vegan lasagna and finishing with some biscotti or ricotta cake ... mouthwatering. Italian food is my FAVORITE! I absolutely love Chicken Marsala... I use Emeril's recipe and just modify it with gluten free flour, chicken stock and marsala wine and it comes out perfect!!! I made it for some company I had recently and they had no idea it was gluten free! thanks for doing the giveaway! i've been gluten-free for the past few months due to suspected food sensitivities and this would be a great addition to my cookbook library! 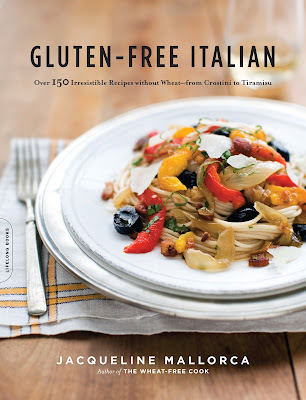 Having this cookbook would surely help me to be a bit more risky when cooking GF Italian. Lately, I have been cooking Schar bran spaghetti pasta. I then add a few tablespoons of Extra Virgin Olive oil to the pasta and mix it up. I take fresh Parmesan cheese and grate it right into the pasta, following the addition of a few tablespoons of fresh Ricotta. I then take some steamed Broccoli (chopped into small pieces) and mix that around with the pasta and cheese. Delicious! Oh my goodness! You had me at Caramelized Butternut Squash Risotto!!! YUM! My favorite Italian dish is eggplant parmesan. Soooo delicious. I would love to win an Italian cookbook. My husband, who is Italian, was raised on bread and pasta. After being sick for 8 years he gave up all his favorite foods. Three months ago he was diagnosed with celiac. He is feeling much better and I would love to suprise him with some of his old favorites!!! He would be SOOOO happy!!! This is great! I'm only worried my oven might be Gluten-contaminated though! Only in my dreams being a newly Gfree person myself! I have just begun experimenting with Italian. marsala chicken and a pizza pasta so far have been my families favorites. I would love to learn more about italian cooking. for the first year we kind of just gave up on pasta then slowly started experimenting with it. now we use it all the time, not always succesfully but we love trying. Our family of 5 has 3 celiacs so we run a 100% gluten free home. We even make guests eat gluten free. Who doesn't love Italian cooking? I like to cook and my son loves Italian cooking. Being gf we eat at home a lot as not many Italian restaurants don't cater to the gf diet.I would love to have a copy of this cookbook. When I 1st found out I couldn't eat gluten I thought I'd never enjoy lasagna again & then my friend took me to the health food aisle & introduced me to rice pasta & I stopped feeling sorry for myself! Please enter me! Woo hoo! I love italian food, and they really know how to make the best GF pasta. Too bad I have to drive 5 hours to buy it!! :( Next on the list of things to try: make my OWN pasta!!! I am secong generation Italian. My favorite dish was a Scicilian white pizza with a thich crust. My Granhdma would make it just for me every time we visited! I have not been able to re-create this GF so far, but I am still trying! I left another comment but for got to eave my e-mail address. So, I will try again. My favorite Italian meal was one my Grandma used to make and UI never could replicate: White pizza. I still have cravings for it after 15 years! I would love to win, my nine year old grandson, who has Celiac disease, along with his Mother, my DIL, loves all things Pasta! This would be great for the sleepovers we have every week. My favorite Italian food is, of course :^), pizza, but I also love any and all pasta dishes. I love ravioli, stuffed shells, lasagna, chicken parmesean, eggplant parmesean. You name it! I would love to win the cookbook. I was just recently diagnosed with celiac and having a hard time finding foods I like that I was eating before. I love Italian food and would love to have a cookbook on how to make gluten free sauces.I live in a very small town were there is nothing offered for me. This cookbook sounds so exciting! I grew up in an Italian house and miss all that Italian food I knew as a child. My mom still makes home made raviolis for every holiday and we have not found a way to make them for me. So, while everyone else is having those wonderful ravs, I have corn pasta. It's just not the same. This book would help me enjoy that wonderful Italian food, just like the rest of my family. On a side note, we've traced our Italian family tree back to the 1500s and what did my family grow back then? They grew two types of WHEAT!!! I am in high school and me and my best friend were just diagnosed with celiac. At first we were nervous about the foods we could eat but now we love to bake all the time! I would like to be able to eat all the foods I used to love. For the past several years, my dad had been experiencing severe stomach pain. Despite seeing several doctors and severely limiting his diet, he couldn't find a cure. After hearing about celiac, my mom thought that this might finally be the answer. He doubted it, but she got him tested. Turns out, not only does my dad have celiac, but my whole family, including my mom, does. While this may have been disapointing news to other people, my mom baked a gluton-free cake in celebration. She loves to cook, and is amazing at it. Ever since our diagnosis, she has baked recipe after recipe of gluton-free cakes, cookies, and breads. She even makes gluton-free bread so I can put a sandwhich in my lunch for school. I want to win the cookbook so I can give it to her to thank her for all she has done for my family. What a great site! I went gluten-free while living in Philly, coincidentally. My husband and I live in D.C. now, and I am always looking out for new g-f cookbooks and recipes and am daily experimenting in the kitchen. Thanks for all you do to help out the gluten-free community. Eggplant parm was always a big favorite along with baked ziti. Glad to see more foods and recipes becoming available. My son was diagnosed recently and finds trying to live GF at college abit difficult! My mom is on a gluten-free diet but it does not stop her from being an amazing cook (whether our homegrown italian or other cuisine). POLENTA is my favorite italian food. I never thought about it being gluten-free as a kid; I just liked it. I would come home from school for lunch whenever it was on the menu. I have been going GF out of necessity for a few years. I have adapted a few recipes but it hasn't been easy. The GF cookbooks out there are sorely lacking since they seem to lack an understanding of real cooking and baking. I am looking forward to this cookbook and hope it can bridge a huge gap between non-GF cookbooks, especially the Italian ones, and GF cookbooks. And make life better for those of us who have to cook for families, not just ourselves. And boy do I miss ravioli! An Italian GF Cookbook sounds wonderful! I loved Ravioli, and it's been 4 years since I've eaten any. Being able to make it would be really good. I know some people have found places that make it, but I usually don't care for premade anything!